For turning the screws on hot issues, Bulatlat has been awarded the Golden Tornillo Award. What used to be a haven for endangered species has now become a site for mining operations. The residents call it destruction, but the government calls it development. RAPU-RAPU ISLAND � In 2001, President Gloria Macapagal-Arroyo visited Rapu-Rapu island (about 600 kilometers from Manila) and said that development will finally happen here at last. How can this be done? She harped on the Rapu Rapu Polymetallic Project as one of the 24 priority large-scale mining projects included in her 10-point program from 2004 to 2010. Billed as the flagship of the country's revived mining industry, the Mines and Geosciences Bureau (MGB) projected from it a potential investment and revenues of $42 million and $246 million, respectively. The MGB also said that the government stands to collect an annual excise tax, without incentives, of about $4.2 million. The project, one of the first new mining ventures approved after 15 years, went into commercial production this year. The company has exported some 4,000 ounces of gold as of October to a refiner in Hong Kong. The project is operated by Lafayette Phil. Inc. with Lafayette NL of Australia, LG Collins and KORES of South Korea. The Lafayette open-pit mining in Rapu-Rapu has an initial mine life of six years. This is expected to yield around 50,000 ounces of gold annually, 600,000 ounces of silver, 10,000 metric tons of copper concentrate and 14,000 metric tons of zinc concentrate per year, according to the MGB. Mining is not new to the people of Rapu-Rapu, a fourth-class municipality in Albay (Bicol Region). During World War II, the Japanese Imperial Army mined in Barangay (village) Sta. Barbara, with residents working the mines out of fear. After the war, Hixbar Mining Company introduced open-pit and tunnel-type mining in the same area. When the company stopped its operations in the 1970s, it left three of four rivers contaminated and a wide tract of land barren and useless. Since then, residents have noticed a strong and noxious odor of water flowing from the area. In 1980, Benguet Consolidated, Inc. (BCI) conducted explorations at Ungay Point in Barangay Pagcolbon but left shortly thereafter. Toronto Ventures Inc. (TVI) followed BCI which further explored the same area and established roadways to the site. Spinifex, on the other hand, studied the feasibility of mining operations. However, the company never explored and mined the area extensively. Based on a 2004 study conducted by Dr. Emelina G. Regis, director of the Institute for Environmental Conservation and Research in Ateneo de Naga University, gold mining in Bicol did not alleviate poverty but actually worsened poverty of local communities. She cited what happened in the gold mining communities in Luklukan Sur, Jose Panganiban, Camarines Norte and Sta. Barbara, Rapu-rapu island in Albay. Her study also reported that aside from environmental degradation, pollution and health problems brought about by gold mining operation, residents become poorer when government fails to rehabilitate the degraded ecosystems on which the people depend to eke out a living. In May 2004, the President issued Proclamation No. 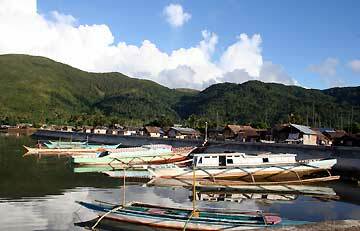 625 which classified as a special economic zone certain areas of Barangays Malobago and Pagcolbon. According to the guidelines of the 2004 Investment Priorities Plan, businesses engaged in the exploration, mining and processing of minerals must be at least 60-percent Filipino-owned to qualify for Board of Investments (BOI) incentives. These include an income tax holiday, exemption from taxes and duties on imported spare parts for equipment, tax credits, exemption from wharfage dues and export taxes, and additional deductions from taxable income. The endorsement of the Rapu-rapu project for ecozone status was first proposed by the Department of Trade and Industry in the wake of the BOI�s decision to exclude foreign-owned mining projects from its list of investments qualified for incentives. The BOI�s decision happened after the Supreme Court declared unconstitutional certain provisions of the Mining Act of 1995 in January 2004, especially those that pertain to financial and technical assistance agreements with foreign investors. But in December 2004, the Supreme Court reversed its own decision and ruled on the Mining Act�s constitutionality. Rapu-Rapu may have gotten its name from the Bikol word yapu-yapu which means an object that is too distant and scarcely visible. The word also means a distant object floating on the sea which describes the geographical characteristics of Rapu-Rapu which is 55 kilometers from the Albay mainland. According to the 1995 census, the island of Rapu-Rapu has a land area of 5,589 hectares and a population of 9,132. Situated north of Lagonoy Gulf, southwest of Pacific Ocean, and east of Albay Gulf, fishing and farming in the upland areas are said to be the primary sources of livelihood. However, the mining for gold, silver, zinc and copper in the area has threatened not only the people�s livelihood but also the environment. �Eleven rural barangays and the town of Rapu-Rapu are dependent on a limited water supply produced by the watershed of the island. At present, some areas of the forest in this watershed are already denuded, thus endangering the availability of water and worsening the present state of the water supply. With mining, competition between the residents and the mining company for the limited water resource becomes even more serious,� it said. The unique biodiversity of Rapu-rapu may also be destroyed, the study said. Endangered species like the yellow-colored oriole and species of pitcher plant may be found there. Residents have also said that there are large brown-colored bats and a rare mollusk called the golden cowry which may be found in the deeper portions of the coral reef at Malobago and Ungay Points. The study said that destruction of the coral reefs is possible due to the siltation/sedimentation coming from mine tailings and contamination from released heavy metals or pollutants brought about by acid mine drainage. Coral reefs supply the needed fishes of the local inhabitants as well as those in the coastal areas of Albay Gulf and Lagonoy Gulf that support the fishery needs of the provinces of Albay, Camarines Sur, Sorsogon and Samar. Even the whale sharks� habitat will be affected. The whales have become a tourist attraction in Donsol, Sorsogon and this has helped raise its status from fourth to fifth-class municipality, according to Carina Escudero, a cinematographer and scuba diver. Permission is granted to reprint or redistribute this article, provided its author/s and Bulatlat are properly credited and notified.